It’s not too early to start thinking about being part of the Reading Holiday Parade! 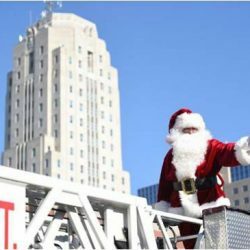 This year’s extravaganza is scheduled for Saturday, November 18 starting at 9 a.m. at 11th Street and proceeding down Penn Street to Second Street. The parade theme is “Home for the Holidays.” We’re currently accepting applications for bands, floats, civic and athletic groups, schools, and similar organizations. Click here for a general application form and related information. Click here for a band application form and related information. Deadline for all applications is October 23. If you have any questions, please feel free to call the DID office at 610-376-6424. We hope you will join us and be part of this wonderful holiday tradition!